An emerging technology could make computers faster and better, but people have to understand how it works first. Quantum computing is the future, we're told. It’s also a head-scratching, brain-melting topic. Don't log off. We’ll make sense of this. And whenever in doubt, just remember a Nobel prize-winning physicist, Richard Feynman, once admitted, "nobody understands quantum mechanics." A good starting point is conventional computers — a desktop, laptop, tablet, smartphone. Conventional computers use tiny switches called transistors, which have two settings and only two settings: "on" or "off." Think of the transistor as a light switch, always toggling. If it is switched on, a one is generated and stored in the computer. If it is switched off, a zero is generated and stored. Each one and zero is called a "bit." Everything that happens in your computer is the result of a series of ones and zeros, whether you're writing a document, reading a story, working on a spreadsheet. 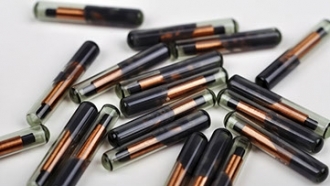 Related Story Are We Entering The Age Of The Biochip? Picture a flipping coin. When the coin lands, it is either heads or tails. When the coin is flipping, it essentially is both. What this means for computing is that since qubits can be a one and a zero at the same time, they can come up with multiple solutions to complex problems at once and arrive at the best result more quickly than a conventional computer. Qubits are free of the classic binary logic that runs through a number of "if this, then that" options until a solution is found. Conventional computers are fast, yes, but with supercomplex problems, they can slow down. Quantum computing fixes that — which explains why governments are in a rush to eventually dominate this technology. "Eventually" is the key word. Quantum computers are in early development. But they’ll get to that superposition — it's as simple as one, zero, three.